Multiple sources have told us that Republican Speaker of the House John Boehner plans to fight to keep the slowdown in the growth of spending achieved in the “sequester,” but that he will not risk a federal government shutdown to fight the fight necessary to defund Obamacare. And as Jonathan Strong observed, beyond the CR, in November or December, lies a needed debt-ceiling increase that the House GOP has long planned to use as leverage against the President. According to Strong’s reporting, confirmed by Hill staffers, Boehner and his leadership team are focused on maintaining the spending levels in the sequester and see that as the better ground upon which to fight. We find it difficult to understand the difference between a government shutdown created by a budget battle over the sequester spending levels and a budget battle over Obamacare funding – the National Parks close and all the other things establishment Republicans whinge about happen either way. Maybe Speaker Boehner has some secret polling data that tells him Americans will pour into the streets in outrage if the sequester spending levels are violated, but aren’t really all that worked-up about Obamacare. We doubt that’s the case, and our suspicion is that the Capitol Hill GOP leadership has concluded that Obamacare is going to implode under its own weight and that Democrats are too overcommitted (and arrogant) to actually admit it won’t work as is and try to fix it. In that calculation it is better for Republican election prospects to just let the debacle happen while continuing to hold meaningless votes to repeal the mess in its entirety. This, as Debra Heine over at Breitbart reminds us, is also a big change from 2010 when John Boehner, Eric Cantor and Cathy McMorris Rogers all said they’d stand tall if the day ever came to defund Obamacare. Boehner’s strong hint that he will actively oppose using the continuing resolution vote to try to defund Obamacare means that the Speaker’s record of folding whenever the opportunity arises to actually use the one weapon the Constitution bestows upon Congress to rein-in the executive branch of government remains intact. Submitted by mjnavara on Mon, 08/26/2013 - 18:28. So, what 'form' of Obamacare will Mr. Boehner and the rest of the Government workers have??? It seems he's not willing to Defund Obamacare, because he and everyone else in Washington, D.C. connected to the Government is getting most of their Premiums paid for by US!, those of us who don't have any money. They all wanted to 'exempt' themselves from this monstrosity but when they were told that their premiums would be 'subsidized', then they said, oh, that's OK then, we'll leave it as is. Whatever happened to fighting for the rest of us. Didn't we elect them to work in Government for US? I think that it's High Time that we clear everyone out of Washington, and I mean 'everyone' and start all over. The Framers of our Country never envisioned that anyone would make a 'career' as a Representative or Senator. Heck, when in the old days they weren't in Washington, D.C., they were working out in the Country. I rest my case. 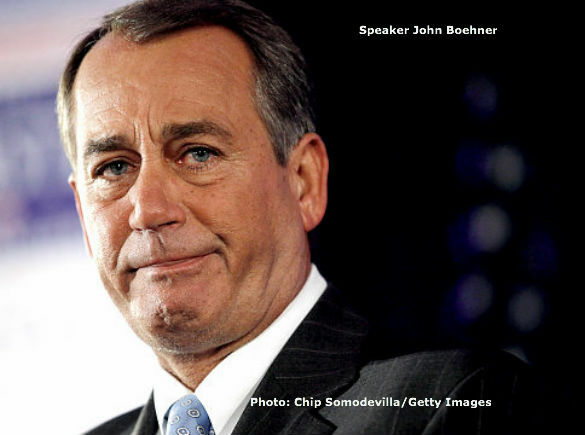 Obamacare will never be defunded as long as Mr. Boehner is in charge. He's as Bad as Harry Reid. Thank you. Submitted by JohnL2 on Sat, 08/24/2013 - 01:03. 3) Get the heck out of the way! So the government shuts down? It certainly will not be the first time this has happened, and for far less important reasons than defunding Obamacare! If Boehner cannot, or will not, do the bidding of the majority of legal American citizens and DEFUND OBAMACARE, he needs to immediately offer his resignation!! Submitted by jmmwilder on Fri, 08/23/2013 - 13:35. He does not have the courage nor the will to do what is right legally and constitutionally. When the House was controlled by Democrats, they didn't blink when standing their ground, especially when a threat of government shutdown loomed because they knew the weak-willed Republicans would cave. It's time we had leadership in the House that truly leads for the well-being of America and her working people over special interests and political cronyism. The only way to right the wrongs is to stand your ground. Compromise only invites further erosion of what makes this country unique. If Obamacare is so great, why isn't Congress subject to it? If it's so great for all Americans, why the need for so many exemptions and delays? It's obvious that there's more bad than good in the law and the House should do everything it can to scrap it--beginning and ending with defunding it!